If you haven’t noticed, we are all about the cloud and creating a paperless workplace. It’s no secret that technology has been evolving quicker than you can say Supercalifragilisticexpialidocious… so with all the changes that are happening, we need to stop resisting and jump on the bandwagon! Most of you are already making the change, but for those of you who aren’t, hurry up! You don’t want to be left behind. 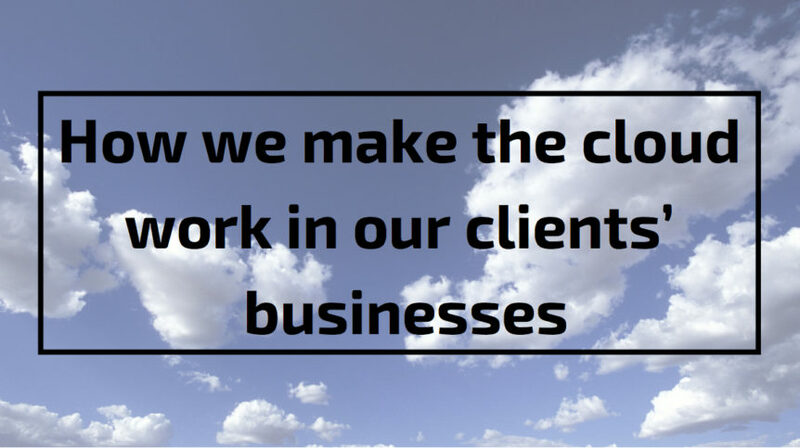 So how do we make the cloud work for our clients? First of all, most of our work is completed remotely allowing us to assist our clients who are interstate. We are smart and savvy so using an online, cloud based HR program only makes sense (derr). We are also all about streamlining your internal processes to ensure you are better managing your team and running a more productive business. In basic terms, we like to ensure our productivity, our team management and feedback as well as our communication is all integrated and collaborating seamlessly. Our clients have invested in our HR services combined with our HR online program to get the most out of hussetHR (and we do give a lot)! The HR system allows us to access and manage their internal HR process, understand the gaps and offer our support in the areas we see is required. Everyone in the business has different levels of access. Employees have access to their online portal (or file) where they can electronically sign for documents, they’re able to receive updates from their managers and read all other important stuff required for their employment. This keeps communication open, unavoidable and really simple. Where we come in is we can actually set up the regular reminders for their employees to sign documents, we can send them important information on behalf of the manager or business owner and we’re able to follow up specific employees to ensure the entire team are on the same page. Managers also have a level of responsibility. The system is only as good as the information that is in it and there’s only so much support we can do on our end. We don’t know what’s going on in their actively working environment… Sorry Managers, but you have to do some work! It’s really critical that managers update, manage and maintain each employee file (like actually manage their staff) with relevant and important information related to the employee’s performance, attitude and behaviour. The best part is (like the heading for this blog) the system is in the cloud so it’s available on tablets as well as on PC’s. Their managers need just as much managing as their staff! We can oversee their team files, ensuring their managers are recording and actively catching up with their team, giving them feedback and regular company updates. It’s all about the engagement and team bonding! Business owners have the power and accessibility to overview all notes kept on employees and they’re able to manage their managers. The whole idea is to keep the communication paths open, all people informed and managed on the right level. We also have access to each system allowing us to manage our clients. It’s all about that accountability! We understand how busy business owners can get with the little things that pop up each day so we like to encourage and support them as much as possible. There’s no point having a system in place if you’re not using it so we like to ensure you are getting the most out of it! A lot of the work is done remotely and from our office, based in Melbourne. We take the pain away and we tend to send reminders and documents to employees on behalf of our clients, ensure correct follow up is made and tie up any loose ends. This takes the pressure away from our clients, essentially providing them with a mini part time HR Manager. Did we mention this is a paperless system?! I mean we are all about holding onto a signed copy of the vital documents but generally you should be saving a scanned copy online, ready to go for any sticky situations. Since we are evolving and more companies are now becoming paperless, the cloud based HR system ensures all information is always documented. It protects your business by keeping your information stored confidentially and securely online therefore no bits of paper are lost or found by the wrong person. You also have constant access to your information anytime and anywhere (where there’s an internet connection). If you haven’t considered a system like this or don’t have one in place, we recommend keeping up with the Kardashian’s and getting online pronto!